Happy New Year! 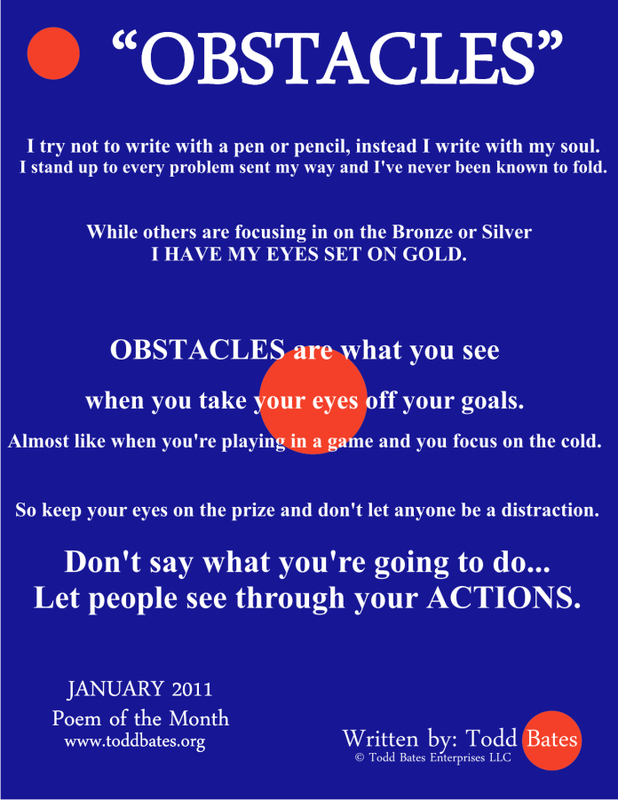 Please take a moment to read the January 2011 Poem of the Month “Obstacles” Don’t forget to leave a comment! Have a blessed month! I try not to write with a pen or pencil, instead I write with my soul. I stand up to every problem sent my way and I’ve never been known to fold. While others are focusing in on the Bronze or Silver I have my eyes set on Gold. Almost like when you’re playing in a game and you focus on the cold. So keep your eyes on the prize and don’t let anyone be a distraction. Don’t say what you’re going to do let people see through your actions. We met at the Jared Allen center today. Good poem, accept as a Decathelete/Hurdler when I read obstacles are what you see when you take your eyes off the goal, I hurdle obstacles that its probably better to keep your eyes on. I hope you continue to share your poems with us.Happy New Year to you and the family again the boys send their love.God Bless You. Awesome stuff Todd. Roll Tide. Ray Hudson told me to tell you “What’s up.” He’s in Bonifay, FL. Good luck to ya friend.